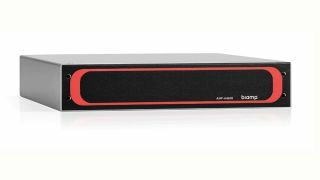 The What: Biamp Systems has launched its new four-channel power amplifier, the AMP-A460H. Created to address the sound needs of small- to medium-sized conference and meeting spaces, the new amplifier is designed to allow integrators to customize the amplification in rooms using Biamp Systems’ TesiraFORTÉ audio processing platform. The What Else: The AMP-A460H analog amplifier features four channels of audio output—60 watts per channel at 8 ohms. Bridged in pairs, it can provide 120 watts at 8 ohms or 120 watts with constant voltage (70V/100V) direct drive. With a compact half-rack design, it includes a mounting kit to fit easily into any standard rack. It also features a balanced analog line in, allowing easy integration with any of the eight TesiraFORTÉ models. Extending energy conservation and reducing costs, the amplifier automatically powers down after 25 minutes with no audio signal. The Bottom Line: With fan-less operation and simple, software-free installation, the AMP-A460H is ready to be placed in any conferencing, telephony, or VoIP environment needing minimal sound distribution. The AMP-A460H will begin shipping this month and is backed by Biamp’s five-year warranty.